More than 200 experts gathered in Brussels on the 3-4 February 2012 to discuss the spread of nuclear and other dangerous weapons. The EU Non-Proliferation and Disarmament Conference took place just as the EU imposed a ban on Iranian oil sales in an effort to persuade Tehran back to the nuclear negotiating table. In accordance with the Consortium division of labour, IISS took on the main organizing role for the conference. 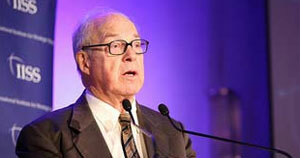 The keynote address was given by Hans Blix, the former Director General of the IAEA. All the Plenary Sessions were recorded on video and are available through this website. Furthermore, summaries of the Plenary Sessions can be downloaded, as well as the Plenary and Special Sessions transcripts. For additional information on the Conference, please see the dedicated Conference website of IISS.